The Skyrocket uses the standard Android gallery. The gallery automatically locates the images and videos no matter where they are stored. It even imports the online photos from your Google Picasa web albums. Little about the Gallery should surprise you – aside from displaying full-res images and the addition of the two-finger tilt zoom, there’s nothing new really. And don’t you worry, the double tap and pinch zoom are still there. You also get an image editor and a video editor preinstalled. The image editor handles the basics like image rotation, cropping (no resize though) and adjusting brightness/saturation/contrast. You can also make selections (using a smart tool similar to the Quick selection tool in Photoshop). It’s not nearly as accurate as the Photoshop tool though. You can apply effects too but the one feature that caught our eye was Context fill – similar to Photoshop’s Context-aware fill tool but, again, not nearly as accurate. 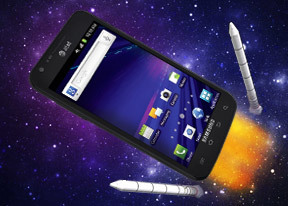 The Samsung Galaxy S II Skyrocket uses the standard TouchWiz music player. Samsung has enabled equalizer presets (including a custom one) along with the sound-enhancing DNSe technology and 5.1 channel virtualization. The video player lets you choose between three crop modes for how the video fits the screen. There’s 5.1 channel virtualization and subtitle support. You can change font size and adjust subtitles sync (adjust them back or forth a few seconds) but there’s no option to manually load subtitles, they have to have the same filename as the video file to load. The video player had absolutely no trouble with any of the files we threw at it – starting with WMV through AVI (DivX and XviD) and MP4 to MKV (H.264). Resolution wasn’t a problem either – the Samsung Galaxy S II played Full HD files just fine. Large files of over 2GB worked as well.